TIU style is used by most of the programs at TEDS and TGS. It is based on the Turabian/Chicago style. Turabian has two styles: footnotes / bibliographies and parenthetical references / reference lists. Most TEDS programs use the footnotes / bibliographies style, except for the ICS, EDS, and DMin programs, which use parenthetical references / reference lists. Counseling uses APA. See a full list of styles by department, and ask your professor for your particular class. The full Chicago Manual of Style available online. CMOS features tools for editors, a citation guide summary, and Q&A where University of Chicago Press editors answer style questions. A short guide to Turabian style. Provides citation samples for both notes & bibliography and author-date (parenthetical) styles. Zotero is a free bibliographic management program that one can use with any of these three browsers: Firefox, Chrome, or Safari. 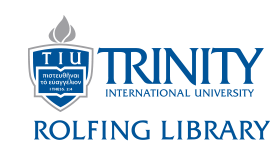 It allows one to download references from TrinCat, I-Share, WorldCat, and most of our databases, including ATLA, Academic Search Premier, and PsycInfo. After downloading references, Zotero can be used with its corresponding Microsoft Word (or Open Office counterpart) plugin to create parenthetical references/footnotes and bibliographies in many different citation styles.